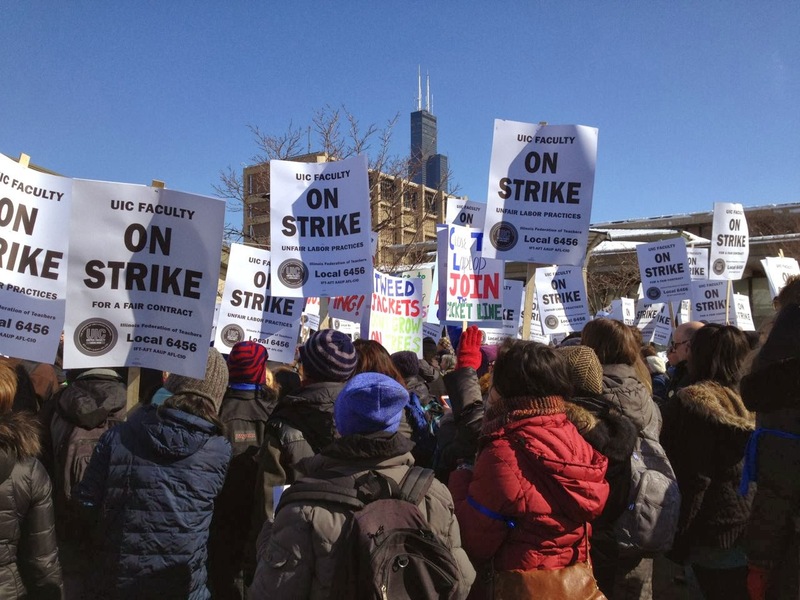 Faculty at the University of Illinois Chicago (UIC) launched a two-day strike today citing stalled negotiations with university administrators. Several hundred people rallied on the Chicago campus this morning, and picketed classrooms throughout the day. Faculty decided to unionize in 2012 citing lack of pay raises and temporary pay cuts during the recent financial crisis, among other issues. Adjunct faculty, who are coordinating bargaining with tenure-system faculty, are seeking multi-year contracts as well as better pay and benefits. As evidence that the university can afford their demands, faculty cite a 25% increase in tuition since 2007, rising enrollments, and a $275 million reserve fund. Illinois faculty are also fighting a major overhaul of their pensions by the state legislature. Faculty are frustrated that 18 months of negotiations have yielded practically no progress of the key financial issues. There is concern that the university is not bargaining in good faith. Professors Lennard Davis and Walter Ben Michaels note that faculty are striking to preserve the campus’s tradition of serving students of moderate means. Every entering UIC student takes at least one writing course; most take two. Not surprisingly, our writing courses are overwhelmingly taught by lecturers (i.e. non-tenure track faculty), on year-to-year contracts and paid a standard salary of $30,000. Furthermore, although the administration carries on endlessly about the importance of merit, they’re unwilling to mandate a promotion track for non-tenure track faculty, the whole point of which would be to reward merit. So what exactly does it mean to insist on the importance of the first year experience and then pay the people most responsible for that experience a wage that virtually requires them to work a second job? What does it mean to claim you want to reward the best and the hardest working when you not only won’t promote them, but you won’t even provide a position they could in theory be promoted to? You’re short-changing both the faculty and the students. The strike continues tomorrow. You can follow this story at the UIC United Faculty website http://uicunitedfaculty.org/ and on Twitter (@UICUF).